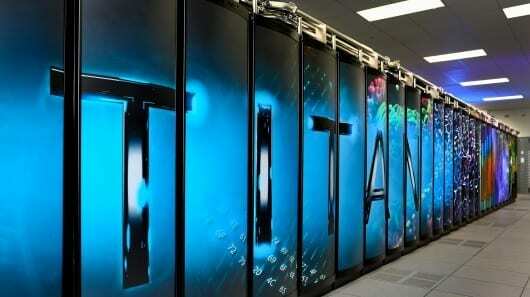 The U.S. Department of Energy’s Oak Ridge National Laboratory (ORNL) has just introduced Titan, the world’s most powerful supercomputer. The size of a basketball court and using enough power to run a small town, the water-cooled circuits of Titan are capable of 20 petaflops or 20,000 trillion calculations per second. This makes Titan ten times more powerful than ORNL’s previous computer, Jaguar and 20 trillion times more than the average PC. What’s more, it achieves this through components originally created for gaming computers. Also known as the Cray XK7 system, Titan has 18,688 nodes. Each of these consists of a 16-core AMD Opteron 6274 processor and an NVIDIA Tesla K20 graphics processing unit (GPU) accelerator. It also has 700 terabytes of memory. GPUs are designed to handle computations simultaneously at high speed and make excellent supercomputer components. The 299,008 CPU cores in Titan are used to guide the simulations, while the GPUs do the brute-force number crunching.